Just call me the painting queen! I have been a very busy bee! On top of my usual crafting and sewing I have enrolled onto an upholstery course. I completed my first class on Thursday and am looking forward to my next one this coming Thursday where I am sure to learn plenty of new skills. 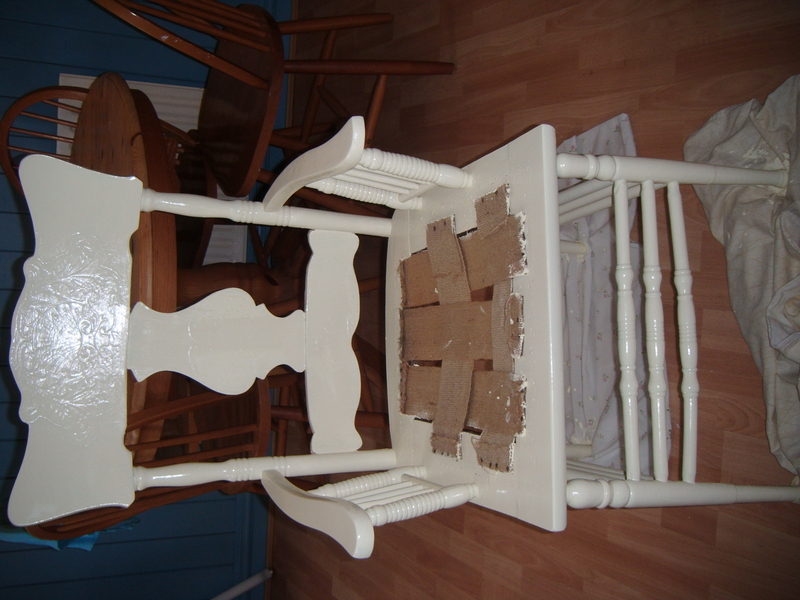 In preparation I trawled the internet, second hand shops and carboot sales and I eventually found my very first project…a battered and creaky wooden chair. 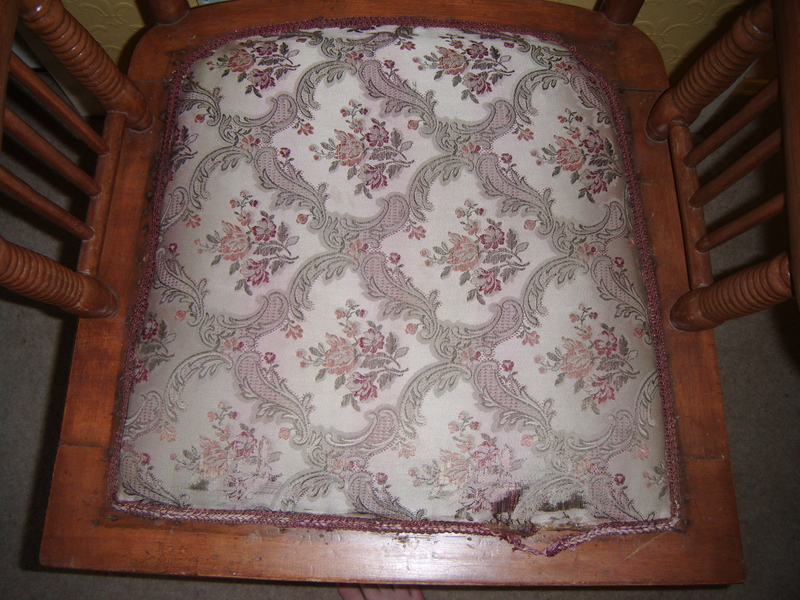 Seat Before - This fabric annoys me because whoever covered it before put the fabric on so it points towards the left. The picture makes it look shiny and quite nice but this is due to the flash on my camera. Unfortunately, it’s quite dull, scratched and in some places chipped. I started with the intention of sanding it right down and re-varnishing it. However, once I started stripping it down I soon found that there was about a million and one layers of varnish sitting on it (only a slight exaggeration :-p). I did consider getting it professionally stripped but as it is my first practice project I decided that it would be far too expensive so have painted it instead. My next class is on Thursday where I will hopefully be learning how to use the tools and starting to re-upholster the chair. 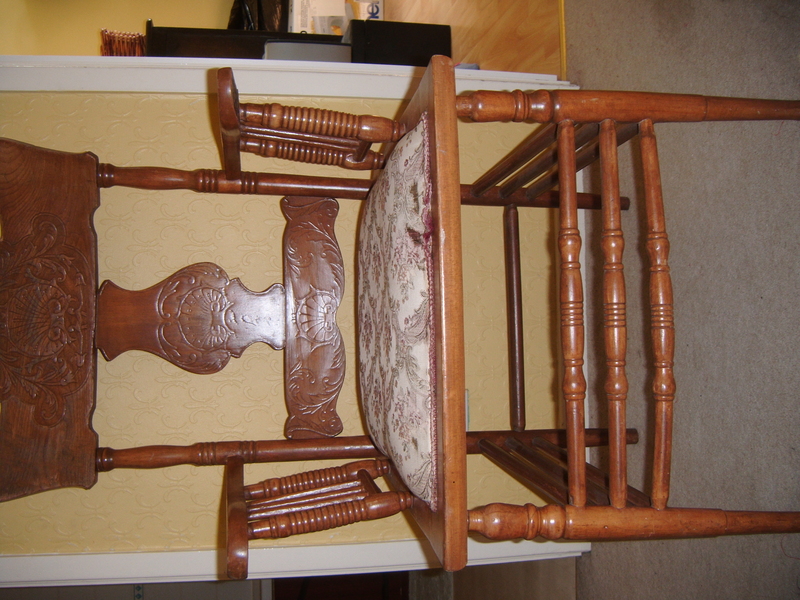 I have an idea of how I want the finished chair to look. 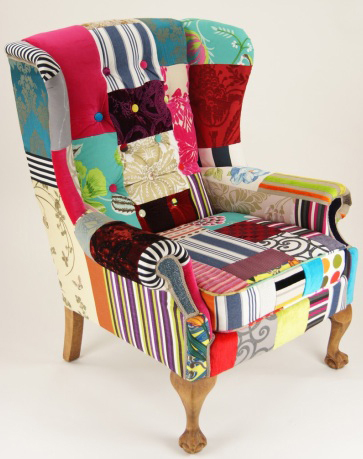 I intend to combine my patchwork skills with the soon to be learnt upholstery skills to create something like the following. I’d love one of the big armchairs, however, I am realistic that it is probably too soon to attempt something so big :-p I would like the seat of my chair to be patch-worked though. Previous Fantabulous Friday!!! Next Nearly finished!! Pretty inspiration pics! 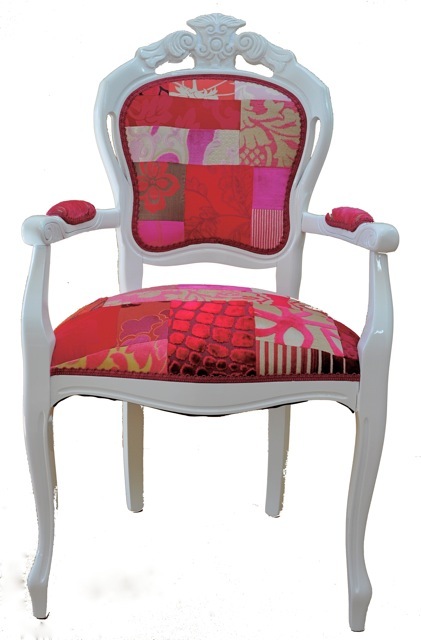 Have you chosen fabric or a color scheme for your chair yet? I like that you painted it white – it looks nice & clean and will look great with bright patchwork like the colors in the inspiration pics. Thanks! 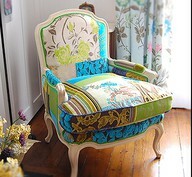 I want it to be bright and really stand out against the white of the chair. I’m thinking of going for bright contrasting colours using different types plain and patterned fabric . I’ve got to go on a bit of a fabric hunt (any excuse :-p) so it depends on what I find.